Saturday 12th: I arrived at the zoo at 8.30am to photograph their sleepy sloth. 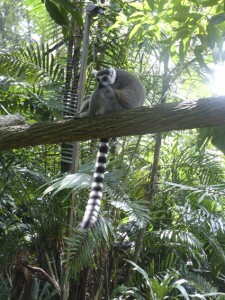 It lives in the Fragile Forest enclosure with hundreds of beautiful birds, bats and lemurs. The lemurs were curled up together having a snooze. The sloth was still asleep in his tree. At feeding time the lemurs walked along the branches to feed on fruit, but the sloth was still asleep in his tree. The bats were almost beautiful up close with the sun shining through their leathery wings. I loved watching the orangutans swing from tree to tree in the canopy of the trees without a wire enclosure. 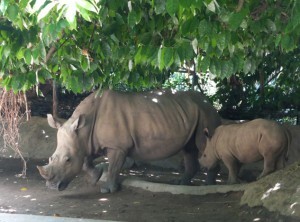 And it was special to see the tiny white rhino and its mum. They are very endangered, so it’s wonderful that Singapore Zoo has a successful breeding programme. In the afternoon I talked at the National Library as part of the Singapore Literary Festival. Then I packed and got ready for a 7am departure to Hong Kong the next morning. Monday 14th: It was great to see Lisa Share again at Kellet School where she had invited me to give a talk in their modern auditorium to Year 4 and Year 5 students. They asked very good questions and it was rewarding to inspire these students. Tuesday 15th: I met Annette Tong at St Pauls College Primary School. When I started my presentation I noticed all the boys were looking at the edge of the stage. 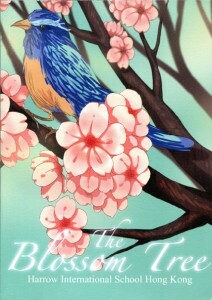 I looked down and saw a tiny little bird hopping along the stage – the bird hopped away and I continued the presentation. In the evening I gave a talk to adults at the Royal Geographical Society. The talk was held at Ming Hua College, and it was great to relax and talk to an adult audience. Wednesday 16th: It was a pleasure to return and talk at the Harbour School. The teacher librarian was at my presentation at a Suchou school in Shanghai years ago, and she remembered me by the cheetah photograph. I enjoyed a wonderful morning with enthusiastic children. Another visit to Kellett School, but this time at the Kowloon Bay campus. Beth McNeilly was a wonderful help and it was fun with Year 1 students. 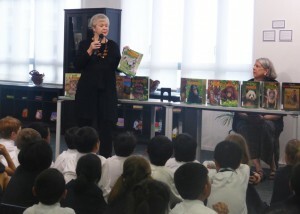 Thursday 17th: Four sessions organized by the librarian Fritzie Habel at Think International School with Year 2 to Year 7 students. It was a very rewarding day with the students. 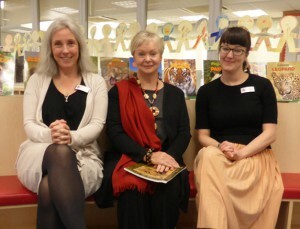 Friday 18th: Mary Jones invited me back to talk to Year 3 students at Harrow International School. She gave me a wonderful gift of two editions of poems written by students. A perfect day to finish my school tour.